Medicare is the health insurance coverage you can receive when you retire at age 65 or have a qualifying disability. It consists of Part A, which is hospital insurance, and Part B, which is medical insurance that covers things such as doctor’s visits, medical equipment or preventative services. Both Part A and Part B can be subject to monthly premiums, annual deductibles, coinsurance and copayments. Medicare Supplement Insurance can help cover these costs. It can help pay for large medical bills, as it can pay all or a portion of the out-of-pocket expense that is not covered by your regular Medicare policy. 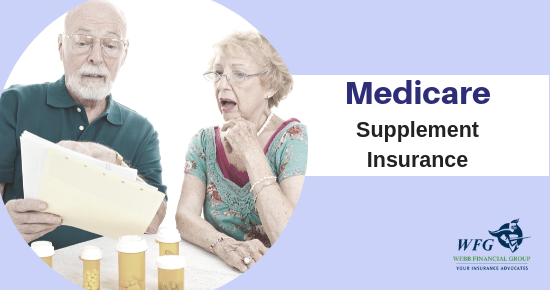 Medicare supplement insurance is only available if you also have Medicare Part A and Part B, and must be obtained through a private company, like Webb Financial Group. The policy only covers one person, so if you and your spouse both want coverage you each need to purchase separate policies. And finally, it does not cover everything, generally excluding things like long-term care or private nursing. If you want to plan for these expenses, Webb Financial Group can advise you of specific policies that will help cover these expenses. There are many different policy options with a wide variety of coverage available to help you pay for your medical expenses. For this reason, you should use an experienced agent, like Webb Financial Group, that has a thorough understanding of these options. They can help you make the right choice so you have the right policy in place when you need it. Call us at 847-604-5434 to discuss your options and get guidance on making the best decisions to cover your medical costs.